We thought we had used up our luck after the simple fix to our brake light issues in Whakatane and we were certainly not expecting our luck to continue in Kopu. The van was booked in to have a troublesome hydraulic jack remove and the suspected bent spike removed and a replacement one manufactured. So early Monday morning the van was duly delivered to the hydraulic repair shop which also just happens to be next door to the RV repair shop where we were going to have a new seal installed around the slide out. Whilst the van was in the workshop we took the opportunity to go for a bit of a tiki tour along the coast north of Thames. 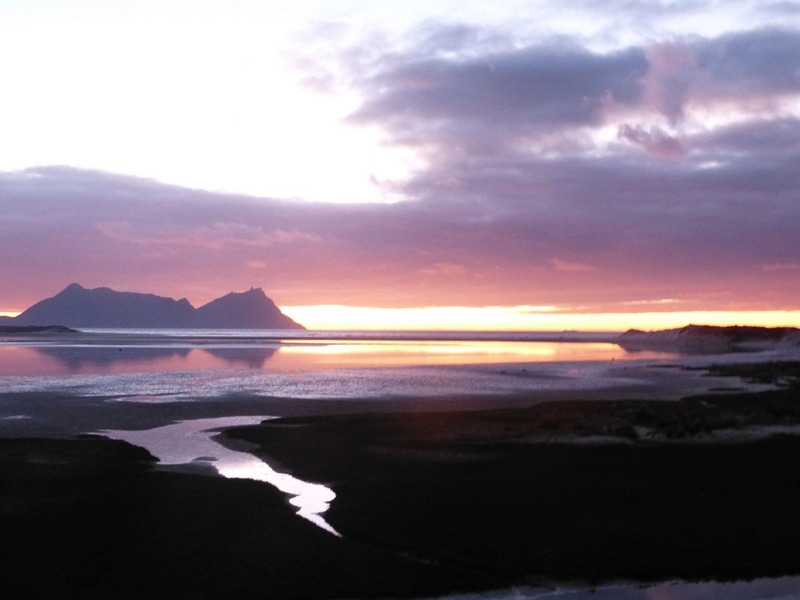 It is a very scenic drive, twisting and turning along the coastline, and I mean right on the coast. We were so enthralled with the road and the scenery that we neglected to take any photos of us exploring the bays along the way. We did take note of the number of Freedom camping areas set aside in most of the way along our route, all duly noted for a return journey at another time. We only went as far as Tapu before deciding we had best return to see what was happening with the van and to make sure we were not going to be haemorrhaging money!!! On our return we were greeted with the sight of the van all ready for us, oh dear we thought, perhaps the job was soo big that they decided to discuss it with us before going any further but no, we were in luck. Apparently the spike was not bent, all it required was a quick clean and grease before resinstalling and voila, it works perfectly! The new seal had been ordered but wasn’t due in until Tuesday morning so we were sent on our way with instructions to remove the old seal and clean off all the residue to expedite the job the following day. That we did, although I do have to say that I thought that our work with the sticky black Simsons sealer was messy but this was just as bad if not worse with sticky gunk getting everywhere. The next morning we were back at the workshop where they quickly were onto installing the new seal. Whilst they were dealing with the slide out, we mentioned the fact that the mechanism had been playing up and sometimes it was very difficult to retract the slide out. Again, expecting to be told that something major was wrong, all that was required was a little greasing of the working mechanism, with instructions on when and how to do this regularly. Phew! Another lucky escape. It was then a short wait for the Electrical Warrant of Fitness to be done. With ticked off the list, we headed off to Waharau Regional Park, one of our favourite places which is just north of Kaiaua ready to settle in for the rest the day to watch the cricket – NZ Blackcaps vs the South African Proteas for a place in the World Cup final. Well, what a game of cricket keeping us all on the edge of our seats right down to the very end. We are avid cricket fans, and we have very fond memories of the 1992 World Cup where we attended most of the games played at Eden Park. We put the win down to good play rather than our luck continuing! just a couple of nights at Waharau before it was time to head off again, but not before getting all the washing done and household chores attended to whilst Roy went off fishing for the day. He did manage to catch a few snapper but they were all of the “return to sea and grow a little” variety. Next stop is at Ardmore Airport where we are for a few days whilst we help our son Antony put together his new house. This means an awful lot of time spent in shops and on TradeMe looking for everything required for a house from whitewear to furniture to cutlery and kitchenware. It’s exhausting but we are getting there. 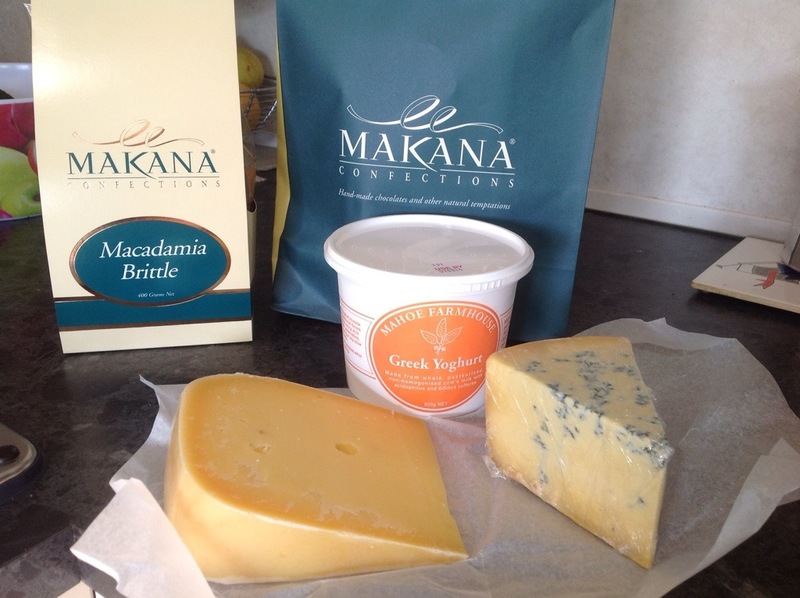 A morning out to visit the Mahoe cheese Factory just 12kms south of Kerikeri at Oromahoe was on the cards. We headed out to try some of their cheeses, they make mainly Edam and Gouda style cheeses with other styles added throughout the seasons. The owners have a very interesting story as to how they started their factory. The following is an extract from a NZHerald article. It is towards the end of 1991 and Bob and Anna Rosevear from Oromahoe are in a hotel in far east Russia having dinner with the First Secretary of the local Communist Party. A television is playing in the background and whatever was on is suddenly stopped and replaced with a performance of the ballet, Swan Lake. They switched channels and Swan Lake is playing on that channel too, and another and another. It was relatively clear something wasn’t right even if they or, indeed, the Communist Party Secretary didn’t quite know what – but it didn’t take long to find out. President Mikhail Gorbachev had been deposed. The Rosevears (and at various times including sons Tim, Jacob and Jesse) were consultants to Sovenz, a subsiairy of the then NZ Dairy Board, and in Russia to teach cheese-making mainly in Kharbarovsk in the north east of Russia just 30 kilometres from the Chinese border, and on Sahkalin Island, Russia’s largest island situated north of Japan. After the Gorbachev coup they were phoned by the NZ Dairy Board to ask if they were okay and were advised somewhat phlegmatically that this was Russian politics and in 24 hours it would all be over. It was, but the putsch had significant consequences for the country since it eventually lead to the dissolution of the USSR. In fact Bob was in Russia again, in St Petersburg, when a subsequent putsch took place. He was watching a live performance of Swan Lake this time, when Boris Yeltzin was replaced by Vladimir Putin. So Mr Rosevear can rightly say he has played a personal part (certainly unwittingly and only in the way of serendipity) in two significant episodes of Russian political history. Where did it all begin? Bob and Anna met at college in Wellington, met up at university again and married and moved north in 1974. They were orchardists before becoming dairy farmers in Oromahoe and had been buying cheese from a supplier in Whangarei who decided to quit the business. Anna had made cheese in the family kitchen and these two facts seemed to go together although, as they were about to discover, it’s a quantum leap from domestic to commercial cheese production. And it wasn’t an investment made lightly because interest rates in 1986 were hovering around 25 per cent. Still, they borrowed some money from a rural bank, bought up some of the cheese-making equipment and dived in. As they say, the rest is history. We bought a piece of their 2014 award winning Champion Artisan Cheese Very Old Edam, a piece of aged blue as well as some Greek style yoghurt. As you can see, we also made a a visit to Makana Confections to taste their chocolates, macadamia brittle and other delights. We just had to buy a little of their product to savour later! 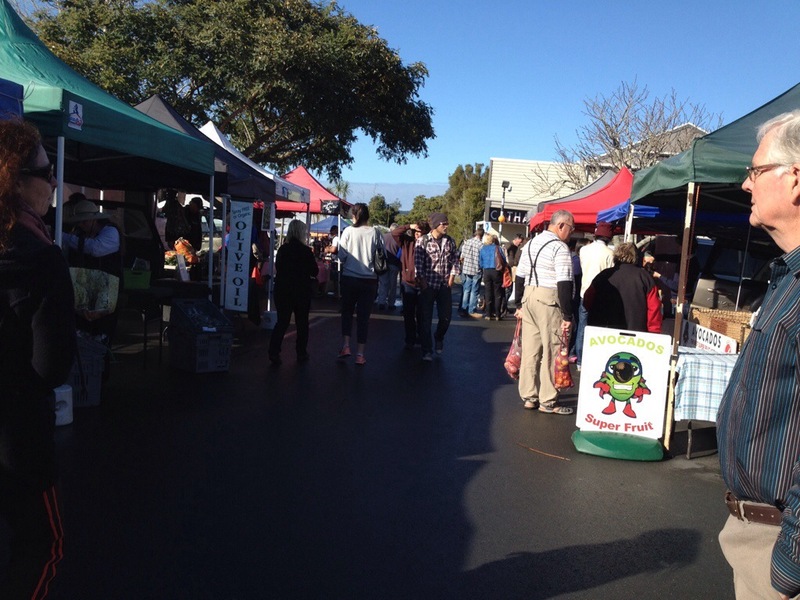 The Kerikeri Farmers Market is held every Sunday morning and is a great market catering for all with stalls selling fruit & veg, artisan products such as cheeses, meats and breads, food to go, plants, coffee, wines, oils, speciality mushrooms and much more. Let’s just say that we have added considerably to the local economy. No, we have not fallen off the face of the earth but we have been holed up at Jacky and Chris’ place at Whakapirau. 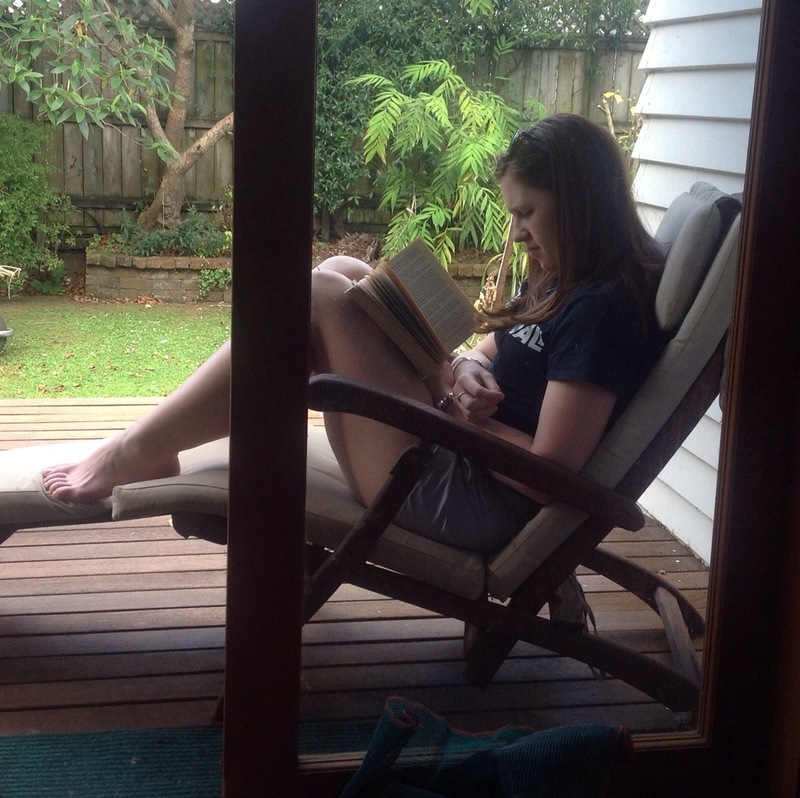 We left the van at Uretiti after making our escape out of the driveway, but then Bernice returned to stay at the van for a couple of nights as the netball ANZ Championship minor semi finals were on. Sunday and Monday nights Bernice spent back at the van whilst Roy stayed on at Whakapirau with Jacky (Chris had returned to Auckland for a few days). By the time Tuesday morning arrived, the weather had deteriorated with heavy rain and very strong winds blowing. Bernice was umming and aaahing whether she should ride out the bad weather in the van or beat a hasty retreat to the calmer climes of Whakapirau. Decision made (aided by the promise of French Onion soup for lunch and Boeuf Bourguignon for dinner! ), a quick trip over the Brynderwyns, through the flood waters around Maungataroto to the relative calm of Whakapirau. Here we stayed for the rest of the week. 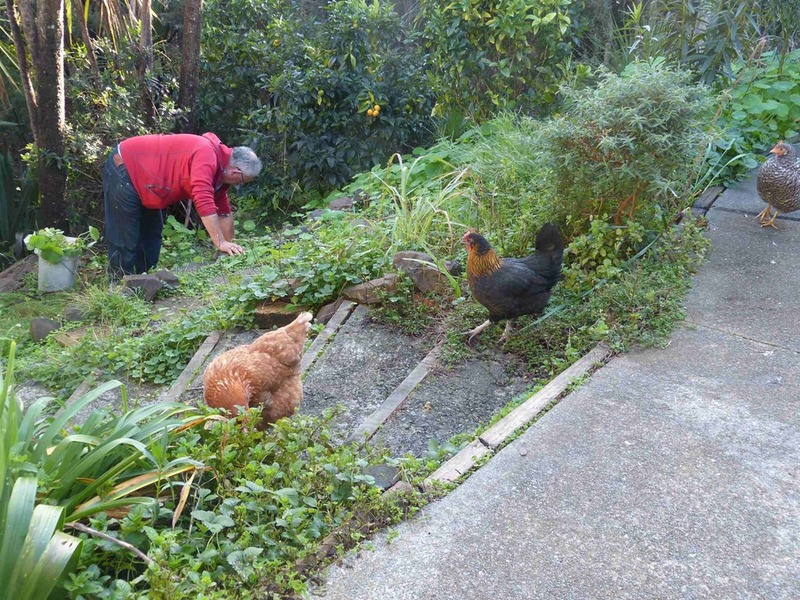 Jacky and Chris relocated their hen Mabel (the brown one) from their home in Auckland to the country. Mabel has made a few new friends and three strays have joined her on the property where they happily roam around. 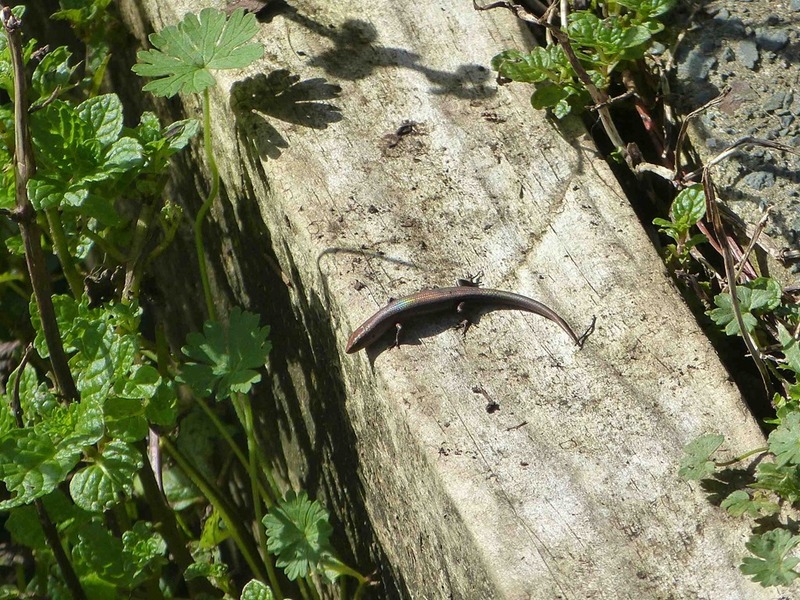 They all became rather excited one day when Roy did a bit of weeding, disturbing the ground and uncovering lots of juicy worms and insects. 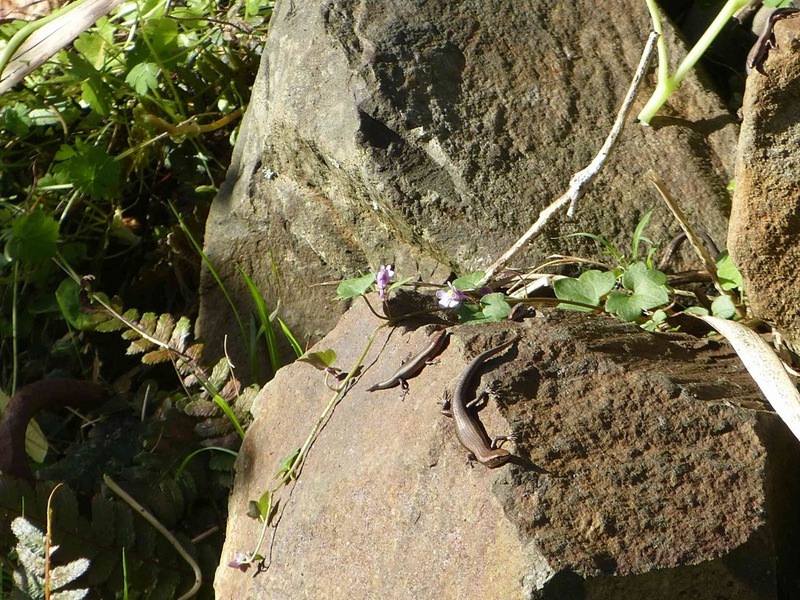 Not only are there numerous birds and other wildlife around the property but there are hundreds of skinks, usually found sunning themselves on warm rocks in the afternoon sun. 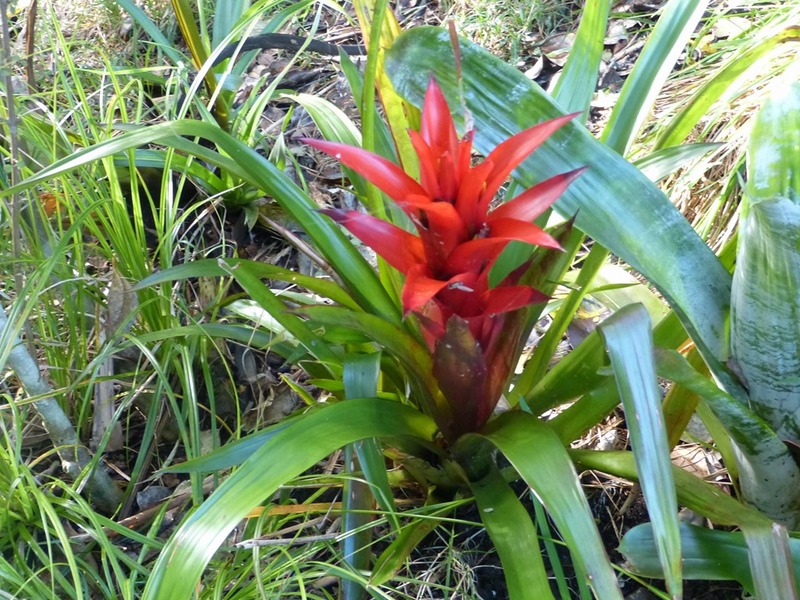 There are also a number of bromeliads growing happily and at this time of the year (winter) provide a welcome bit of colour. By the time the weekend came round it was time for us to head back to the van at Uretiti as Monday morning the van was due in at Whangarei as we had booked it into a car painters to get a professional cut and polish. It was to take them all day Monday and half of Tuesday to complete the work and as the netball semifinal between Waikato Magic and Queensland Firebirds was to be played on Monday evening, we arranged to stay on site for the night. Whilst the van was being beautified, we took the opportunity to get lots of shopping done, we managed to pick up lots of bits and pieces we had been meaning to pick up for some time, little things such as; cables to sort out reception for the second TV in the bedroom, new fly screen material, get spare keys cut, WoF for the RAV and new brakes fitted, new covers for the car seats and a piece of matting for the van. As well, we managed to catch up with friends Dave & Di (ex Oamaru). Although David was currently away in the UK, we had a good catch up with Di and caught up with all their news. 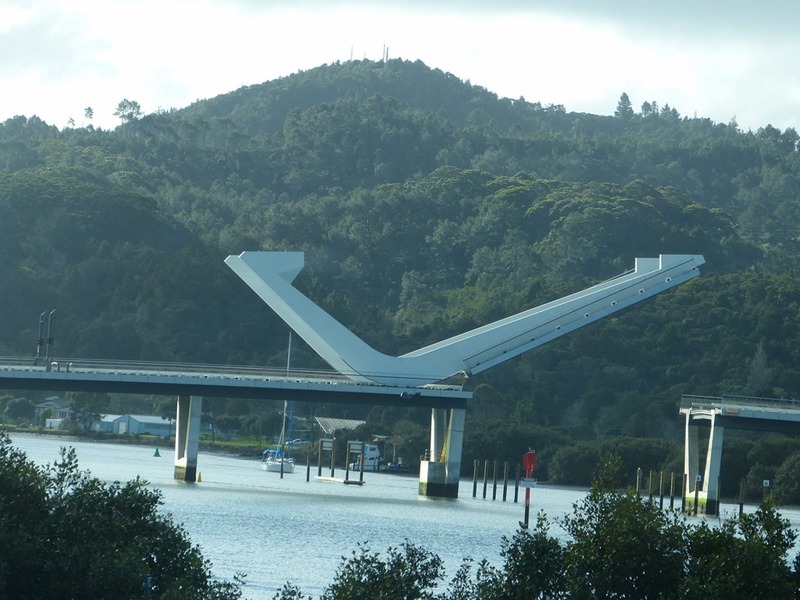 One day whilst passing the bridge over the Hatea River – the entrance to Whangarei Harbour – the bridge was being raised to let ships through. 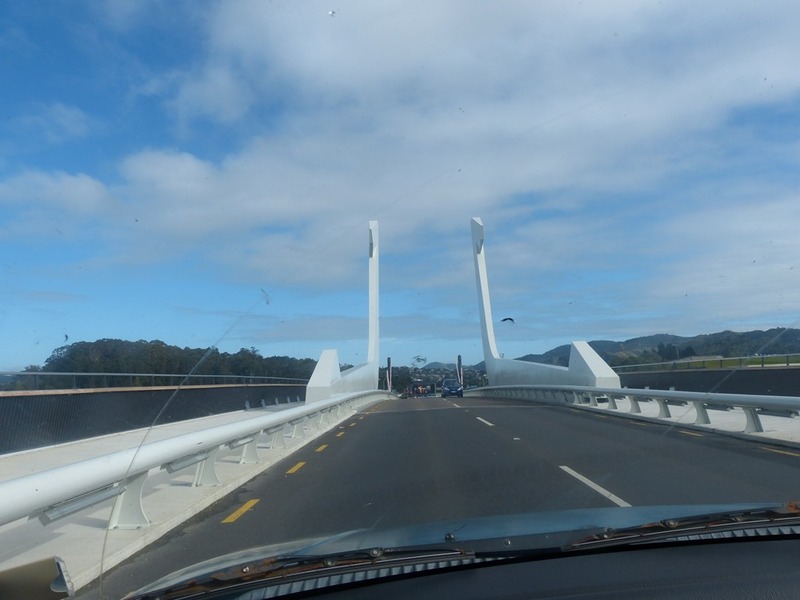 The Bridge is officially called Te Matau a Pohe – translated as ‘The fishhook of Pohe’ the Maori chief who welcomed the first English settlers to Whangarei. Pohe was very skilled in manufacturing fish hooks using traditional materials and styles. His hooks were so practical, many of the settlers used his hooks in preference to the standard English hooks made of steel. 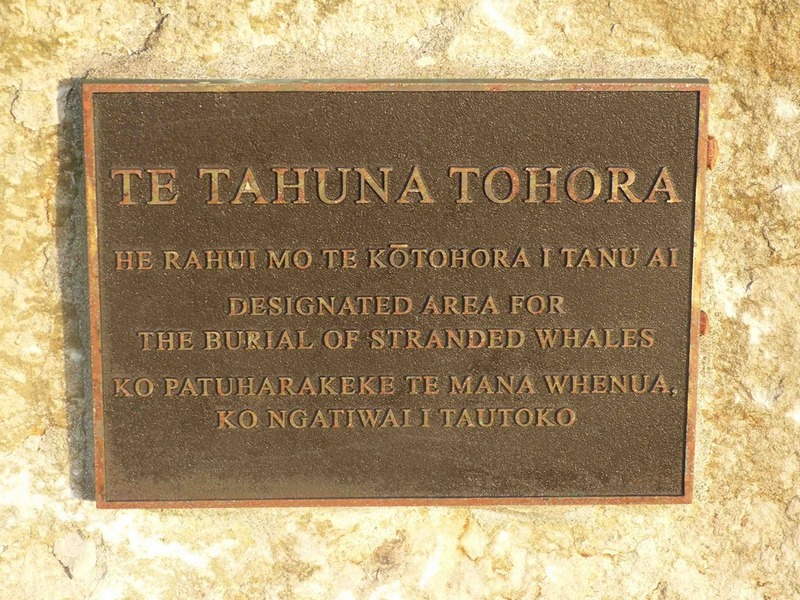 He was also instrumental in building bridges between the two cultures during the first years of English settlement amongst Maori. Pohe used his ranking to protect many of the first settlers from being killed. It is certainly a stunning looking bridge with the raised portion shaped like a traditional fishing hook. We picked up the shiny, polished van on Tuesday afternoon and headed back out to Uretiti. Pat & Sue parked on the left, the Vannini’s shiny van on the right. Now for the nature segment and unusual sights, odds and ends. 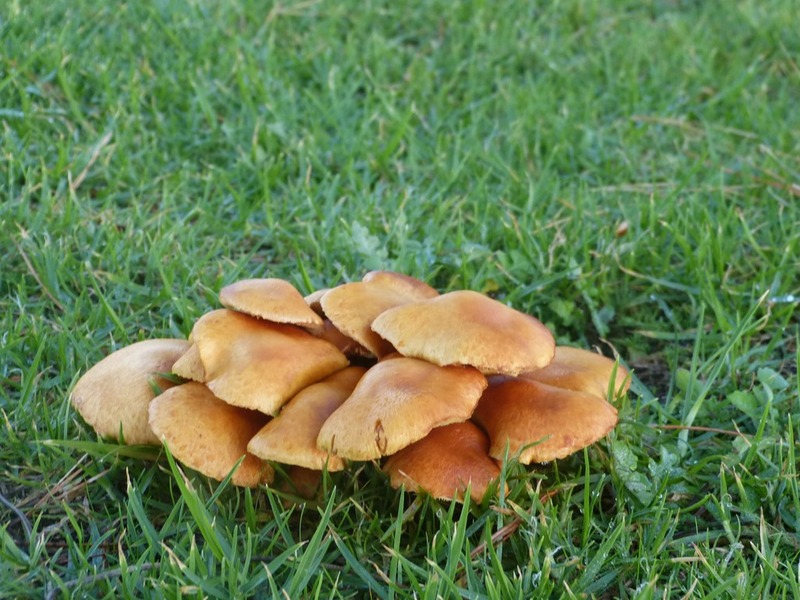 These fungi are seldom seen growing from the ground, it is much more usual to find them on dead or dying wood on trees or on the ground. Well in this case they are growing from fallen wood as a little scraping around found that they were growing for some rotting wood a few millimetres below the ground. 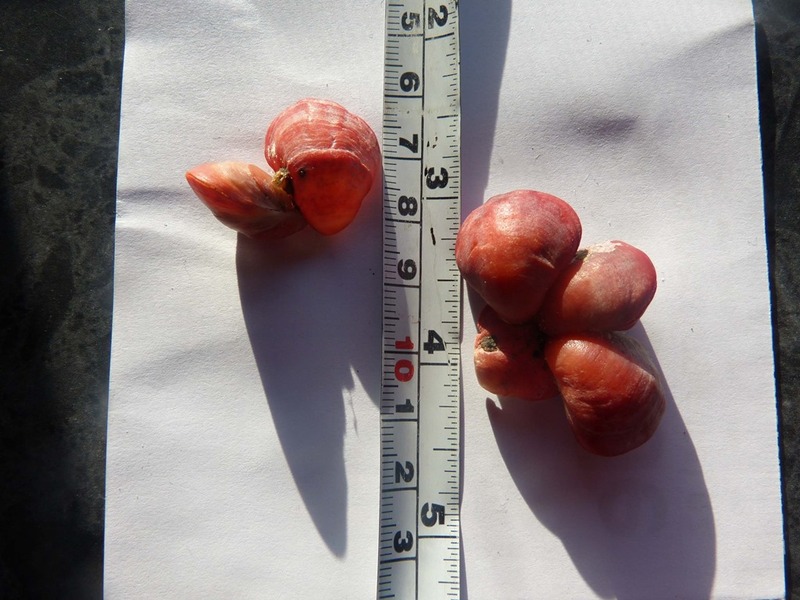 These shells were washed up the other day and I have not been able to identify them. They are a little unusual in that they are growing as a cluster attached to each other, but not from a common point. Any help in identification would be appreciated. 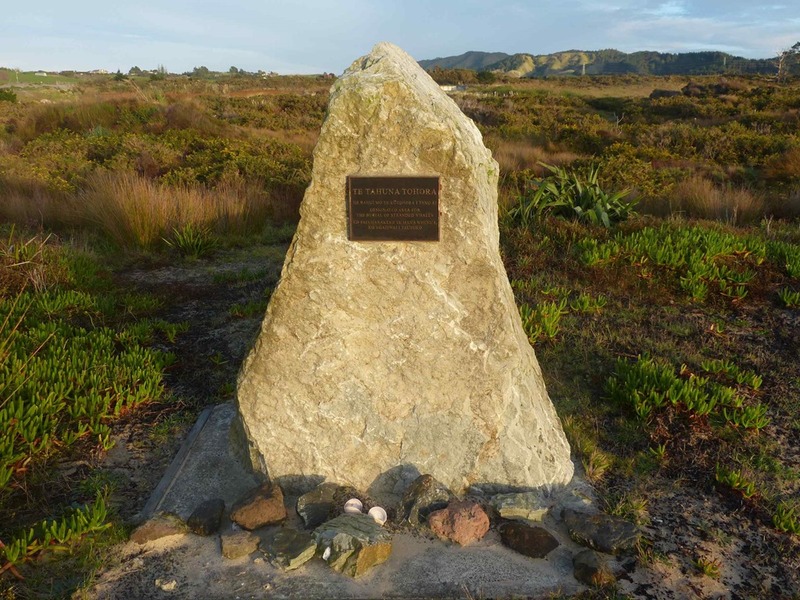 Throughout New Zealand there are many unusual monuments in out of the way places. 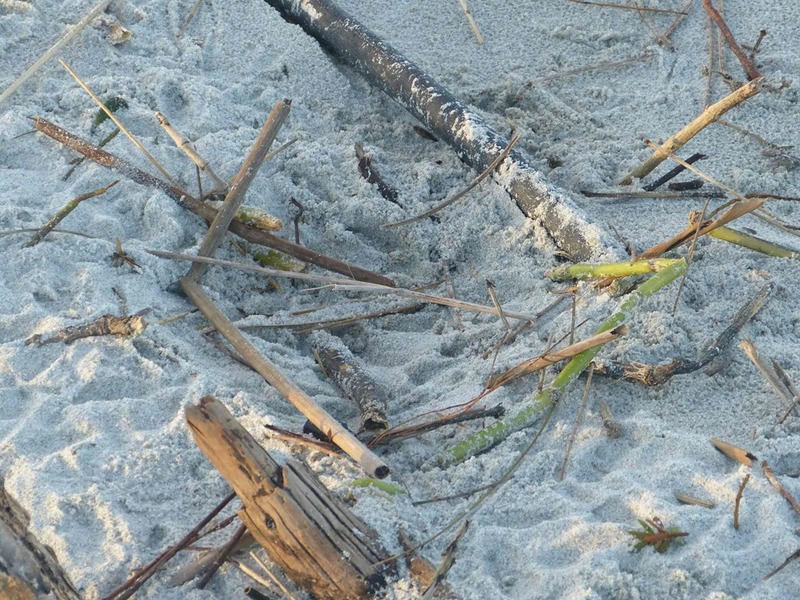 This one is about 50 metres behind the front sand dunes on Bream Bay just north of Uretiti. A close look revealed its unusual purpose. 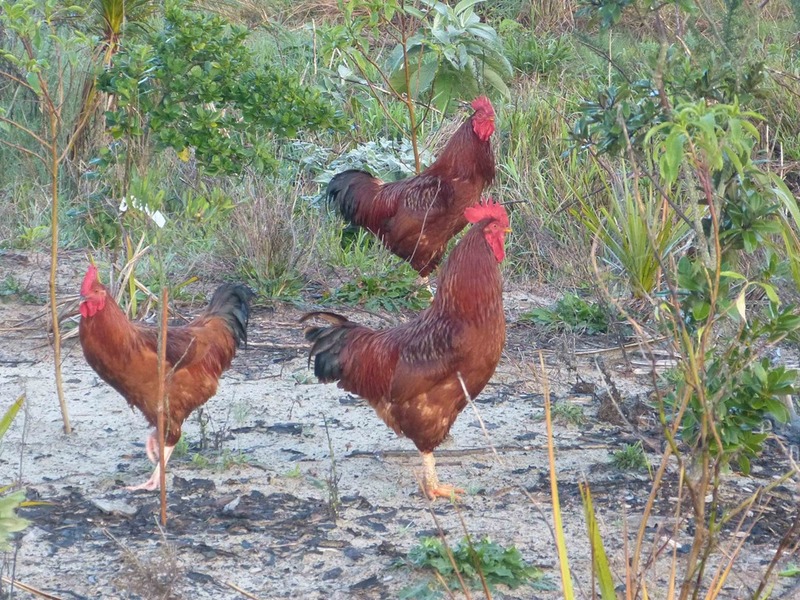 Bernice woke one morning complaining of the noise from a rooster or roosters. There are no houses or properties with signs of sheds or chicken runs anywhere in sight from the camp. 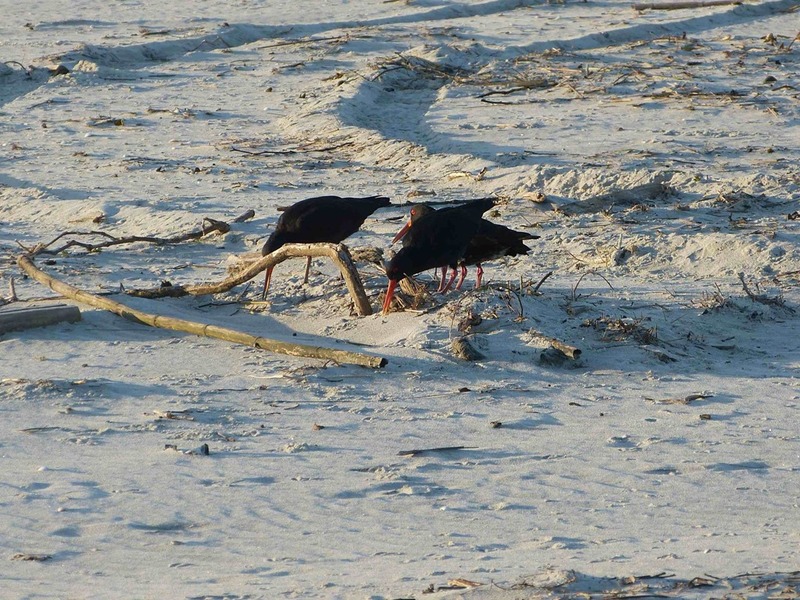 On a walk around several days later found these three enjoying a sunny morning in the sand dunes. 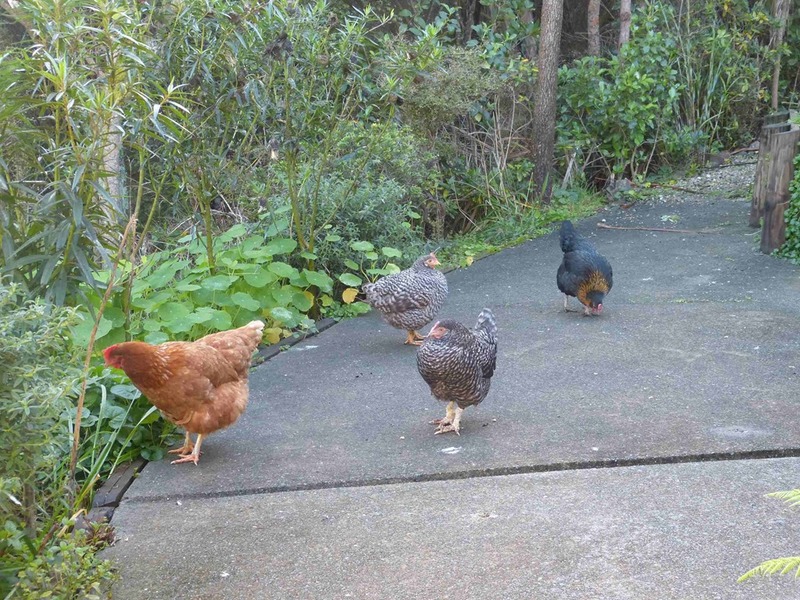 They join the large number wild hens and roosters seen on the side of the road throughout New Zealand. Obviously these were the culprits that disturbed someone’s sleep. 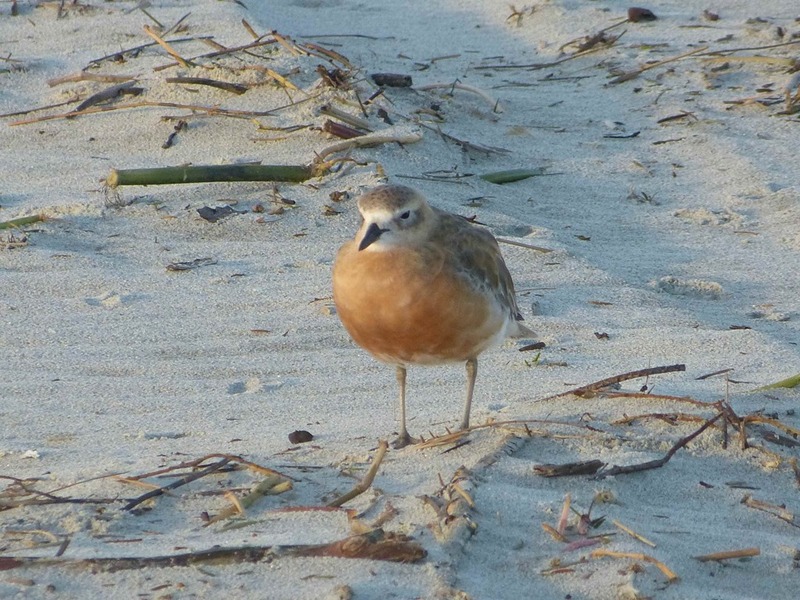 Out on the sandspit there were large numbers of birds often guarding territory or simply displaying consternation at my presence. These three were looking as if they were arguing over the architectural merits of the ground they were standing and stamping on. Why three, not sure perhaps adults with a chick from last season. And this pair were also remonstrating about foreign invaders. 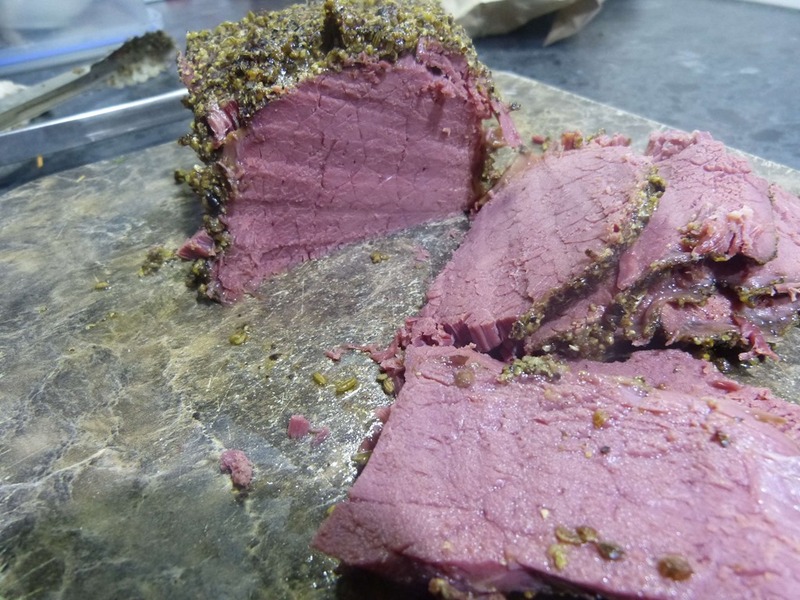 Over the weekend, we tried our hand at making Pastrami. We were very pleased with the result although we will tweak the proportions of the spices in the mix we made to cover the outside of the beef. Needless to say it did not last very long! 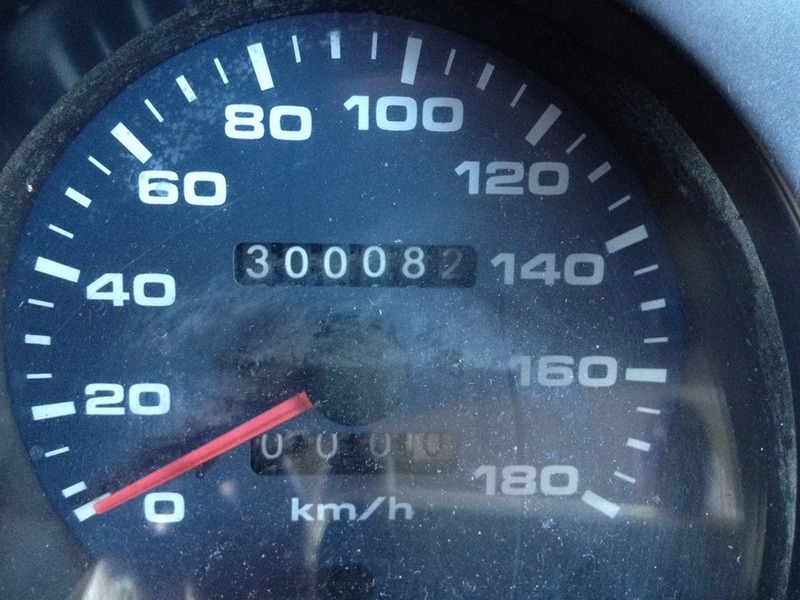 Finally, the RAV ticked over a milestone recently – 300,000kms and still going strong! The blog post on our tiki touring around the Kaipara is coming …..or so he says…….meanwhile onto much more exciting things, shopping! Those of you who know me well will no how much I detest shopping, especially the time wasting habit of window shopping – Aaaarrrrrgh! I can think of much better things to do. We dragged ourselves away from the sights and delights of Whakapirau to venture into Auckland as he need to have a repair done on his hearing aid, and we needed to attend to a few other matters as well. 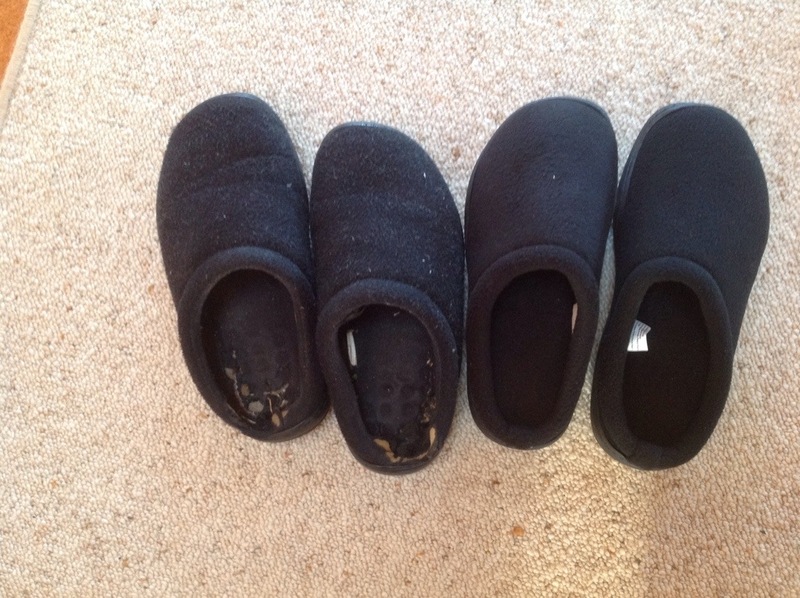 First up, I needed a new pair of slippers, my last pair have served me well but there comes a time when you just have to ditch them, so a quick stop at the Zierra (ex Kumfs) store in Albany and I could tick that off my list. Next, it was a trip down to Takanini to the NZMCA (NZ Motorhome Association) to pick up our new DOC (Department of Conservation) passes as our old one expires at the end of this month. This annual pass allows us to stay in DOC camps all around the country and as we are heading northwards again shortly, we shall need our pass as there are a number of splendid DOC camps to stay in. From there it was into town to meet up with Roy to complete our shopping. A few grocery items were purchased then it was time to hit the road again as we wanted to get across the Harbour bridge before the peak traffic hour(s). That meant a trip back to Albany mall where Roy could sort out his phone with Vodafone, meanwhile I wandered off to have a look at Howard’s Storage – I just love all those neat little containers that tidy everything away and I could not resist buying a new shower caddy. Then it was back to meet up with Roy who was happy as he had sorted out his phone. On our return to the car, we walked past Stevens – a kitchen supply shop. I had looked in there a week or two ago as I was eyeing up a pasta machine. I have a very good Imperia brand one that I have had for many many years however it is packed away in storage down in Oamaru along with the rest of our possessions. The one I was looking at came complete with ravioli maker et al but of course, it is not on special any more so it is back up to its full price. Damn, I knew I should have bought it then. 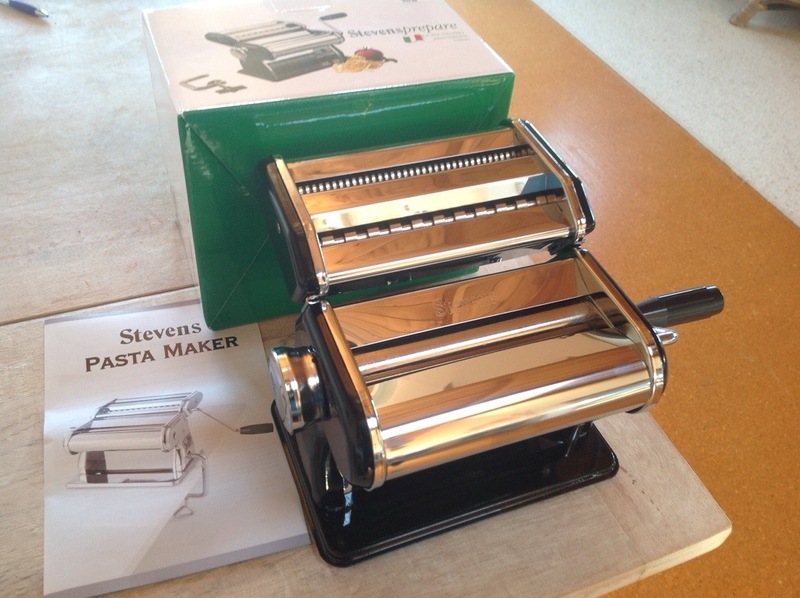 However, they had another one of their own brand ones on special, pasta maker complete with spaghetti and fettuccine/tagliatelle cutters for the stupendous price of ………… $29.95!!!! Who could resist that bargain? It has to be said that we have never really been very good at making plans and sticking to them, we seem to always be making plans only to immediately change them. I guess you could say that we are fortunate to be able to be flexible, and can go with the flow! We spent nearly a week at Ardmore, we had a few chores to attend to, people to see, that sort of thing. Most things were done fairly promptly and we also spent some time with Antony utilizing his wifi as Roy had some serious uploading to do. We are very limited with the amount of data we are able to access as the maximum monthly allowance is just 5GB of mobile data before we have to pay silly rates for any additional data. One day New Zealand telco companies will catch up with the rest of the world and we won’t be so limited. It makes for running a small business which is reliant on the Internet a tad, shall we say, challenging. Sue & Pat joined us at Ardmore although they were busy chaps tripping around the countryside delivering their ute to Tauranga, as they had sold it, and off to Hellensville to pick up their new tow car then off to Hamilton to have the A-frame sorted. We successfully fulfilled our role as security guards for their van whilst they were away. 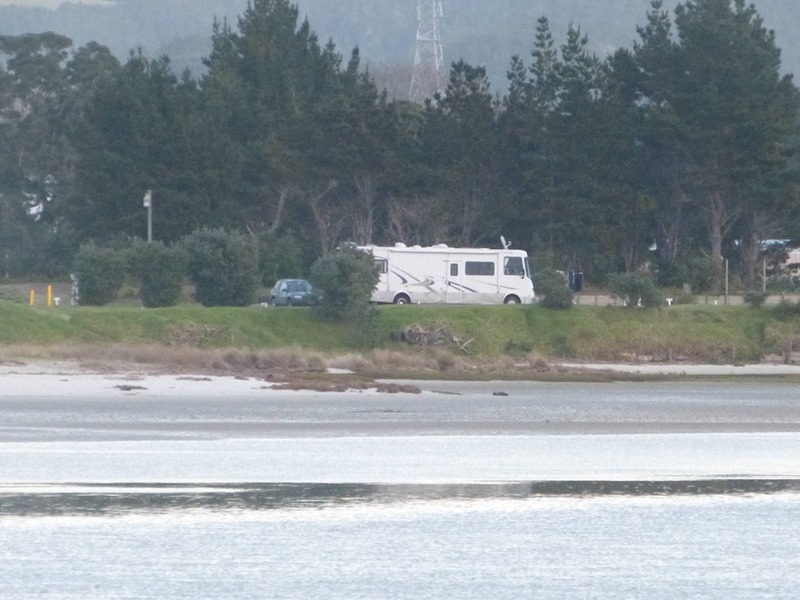 Midway through the week we were contacted by friends Mark & Glynnis who just so happened to be in Auckland in their Motorhome. 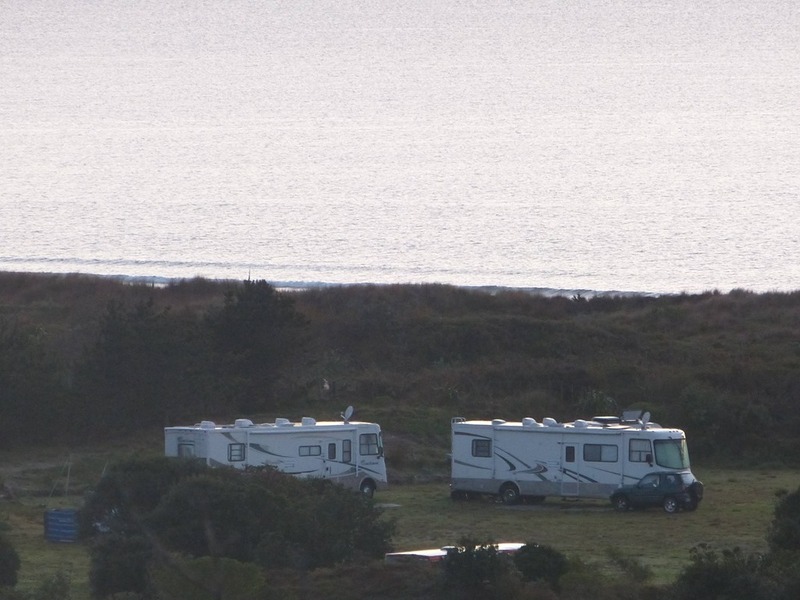 They were heading for the boat show on Friday and planned to come over to Ardmore to spend the night with us and do some catching up. Roy and Mark have known each other for some time now, as Mark used to work for Roy in the computer department at Kinleith in the late 60’s early 70’s. They spent a bit of time going hunting and fishing during that time, when they were younger – and fitter! We had previously caught up with them when they lived at Waiaua We spent a lovely afternoon and evening catching up with each other’s news before they headed off on Saturday morning. We had other plans for Saturday, we went over to Steve & Leslie’s in Torbay for dinner and to spend the night with them. And again, another very enjoyable evening was had before we left on Sunday to attend to a bit of shopping at Albany. With the eftpos/credit cards getting a good airing and with most things ticked off our shopping list, it was back to the van at Ardmore and unpack the purchases. Our plans at this stage were to head off on Monday to Whakapirau on the Kaipara Harbour which is where Jacky & Chris have purchased a property. We have been planning to go there for some weeks, but our plans keep changing. And this week was not going to be any different. It turns out that Antony is moving to a new flat next weekend and he asked if we could help him with the move, of course we can, we said, what’s another change in plans? New plans were quickly formulated for the week, a trip out to Awhitu Regional Park was the order of the day where we will spend the week before heading back into Ambury where we will park up whilst we help with the move. We arrived at Awhitu on Monday afternoon and after a quick reconnoiter we were soon parked up and made ourselves comfortable. 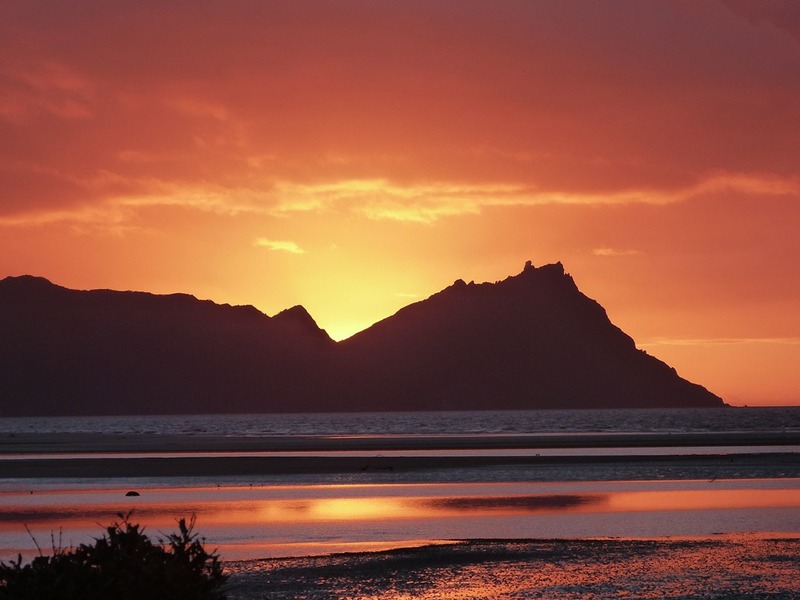 Awhitu is another one of the 26 Auckland Regional Parks and is located on the southern peninsular of the Manukau Heads. It is a lovely park, beautifully maintained and full of bird life, lots of lovely trees and plenty of nice camping areas complete with barbeques, tables, fresh water and toilets. There are some lovely beaches as well, where the net got set out but the flounder were avoiding us on this occasion. 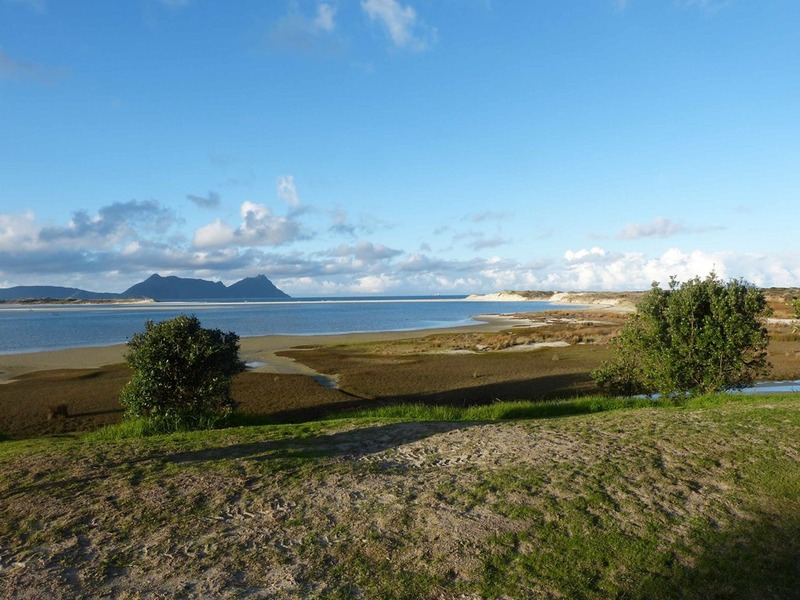 Whilst here, we gave John & Margaret (fellow motorhomers see https://brvannini.wordpress.com/2013/12/20/and-back-to-kaitaia/) a call as they are building a house at Clarks Beach. We made arrangements to pop down to see them on Friday for morning tea, however another change of plans would evolve. Instead we are now going down to where they are parked up at Clark’s Beach to join them for the evening. That is the plan as I write this on Friday morning ; tonight Clark’s Beach, tomorrow Ambury, then off to Whakapirau on Monday. Watch this space to see if we actually manage to keep to these plans. PS. No photos in this post as I have “misplaced” the accessory device I use to load photos from the camera card onto my iPad. Hopefully it will reappear soon. Whoever said that by living in a Motorhome we would be eating “camping food” is just sooooooo wrong on so many levels. For a start, I am not too sure exactly what “camping food” is; is it dehydrated, reconstituted, lightweight, prepackaged, pretend food? Well, that’s not what we enjoy eating. 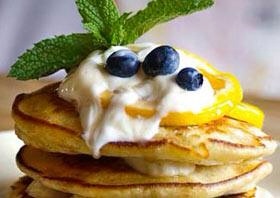 We eat fresh, local, meat, fruit, eggs and veg and take advantage of any free range foraged foods I.e. Mushrooms, blackberries, fish etc. I make a fresh loaf of our own sourdough bread every three or four days and with the abundance of fresh (and cheap) produce available at the moment we also make our own pickles, chutneys, sauces, jams, preserves. The last few days have been pickling and preserving time in the Vannini van, as just around the corner from Ambury Park is a very good market garden where they grow and sell their produce. The outdoor tomatoes are at their best and cheapest right now with a large variety of different types of tomatoes as well. 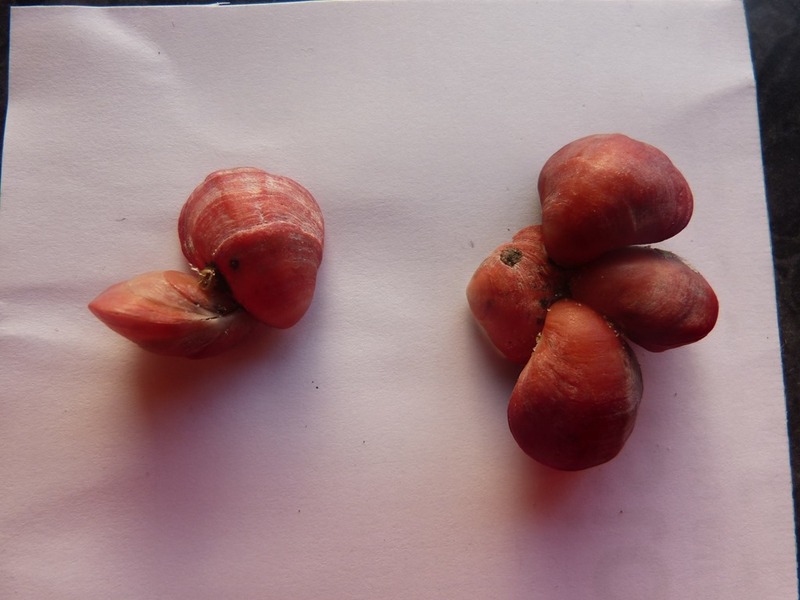 Our favourites are the beefsteak variety which are large, fleshy, with few seeds but packed with flavour. They also grow eggplants, peppers, zucchini, a variety of greens of all sorts and sizes as well as herbs and plenty more. 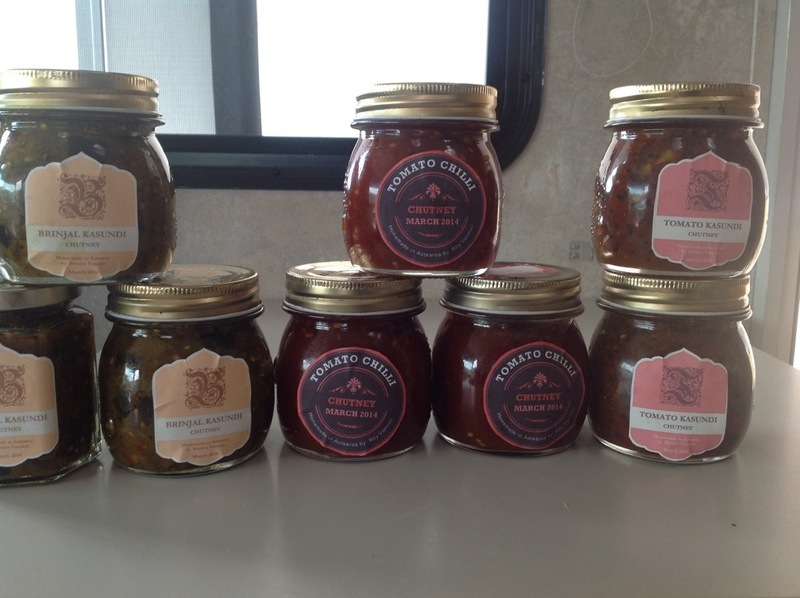 A day or two has been set aside to cook up a few batches of pickles and chutneys. Just small batches, as there is just the two of us (plus the occasional visitor). Of course I had already made a large batch of zucchini pickle for Alex brvannini.wordpress.com/2014/02/17/a-week-of-whangamata/. And she took a good supply of this back with her. When at Kawakawa Bay, see https://brvannini.wordpress.com/2014/01/14/chores-and-more/, I made plum sauce. 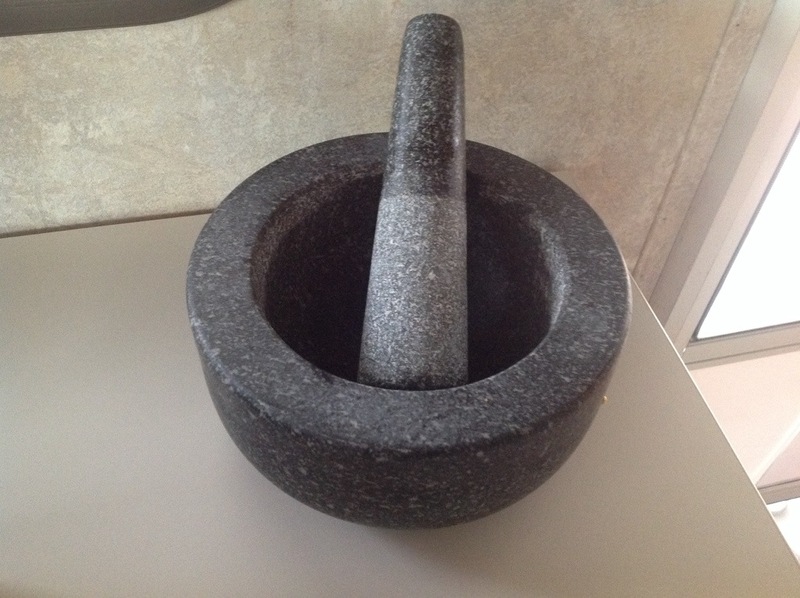 My new acquisition made light work of grinding the spices and one small batch of chutney was made. Next on the to-do list was a Brinjal Kasundi, an Indian Eggplant relish which is particularly delicious with ham. 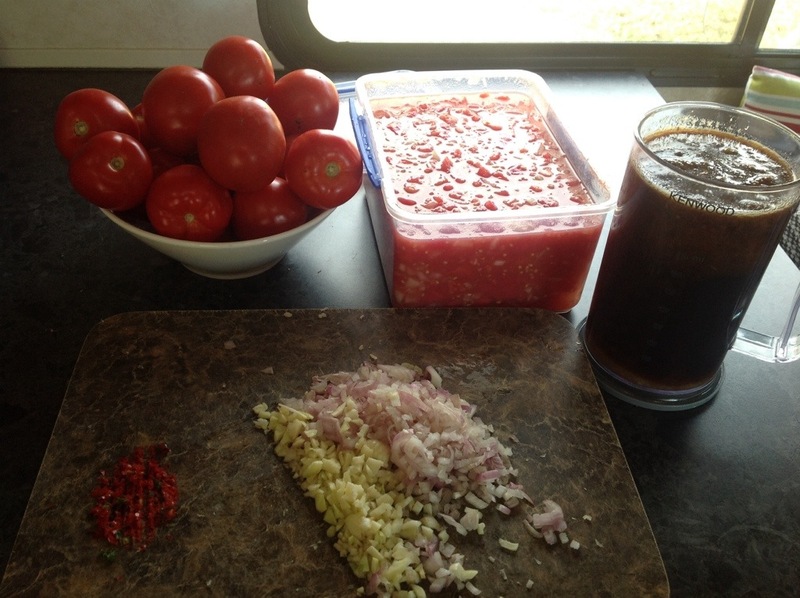 Then it was time to make a Bernice special – a Tomato Chilli Relish that I accidentally invented a year or two ago. It came about by making a batch of tomato relish and at the same time a tomato chilli relish, however, the former was far too sweet for my taste and the latter much too hot, so I combined the two to make a delicious relish. The methods of making were quite different from each other so I rewrote a combined recipe by tweaking both a little here and there resulting in a delicious relish/chutney just how we like it. a selection of today’s makings. Now we are making another batch of the Chilli tomato relish as it is a particular favourite, and also a batch of a tomato red pepper chutney. With all this pickling and relishing I began to wonder, what is exactly the difference between a pickle and a chutney and a relish? According to some wise chap – Chutney is an ancient condiment that originated in India thousands of years ago. The men of science and wisdom, the Brahmins, had discovered the healthful qualities of spices. Foods could be made to last much longer without spoiling by cooking rich mixtures of spice into them. It was considered a blessing of the gods that the foods also became more delicious to eat. A relish is a cooked or pickled, chopped vegetable or fruit food item which is typically used as a condiment. The item generally consists of discernible vegetable or fruit pieces in a sauce, although the sauce is subordinate in character to the vegetable or fruit pieces. It might consist of a single type of vegetable or fruit, or a combination of these, and the fruits or vegetables might be coarsely or finely chopped, but generally a relish is not as smooth as a sauce-type condiment, such as ketchup. The overall taste sensation might be sweet or savory, hot or mild, but it is generally a strong flavor that adds excitement to or complements the primary food item it is served with. Hmmm….does that make sense to you? Anyway, don’t get me started on what is a jam, jelly, preserve or conserve, we could be here for a while! The arrival area of Auckland international airport is always a fascinating place to people watch. Where have they come from? Who is meeting them? What is their relationship? It’s interesting to watch and speculate. Antony met us as the airport as we were all there to wait for Alex to come through from her long journey (30hrs) from London. 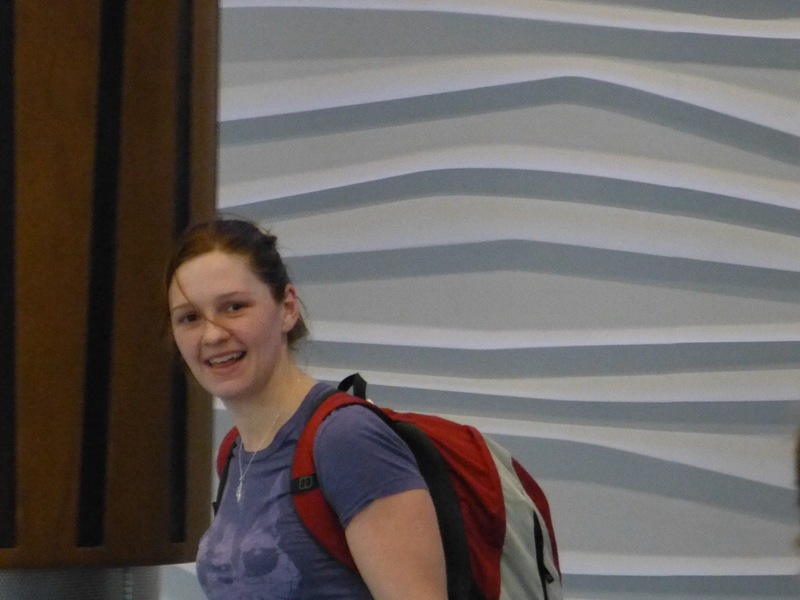 We only have her with us in NZ for just a week, and we only get to see her for a day before she heads south for Lee’s wedding. It wasn’t long before she came through the doors. She was pretty well exhausted by the time she was here, but we soon headed off to our second home at Jacky and Chris’ place where we are staying for a couple of nights. Alex had a quick shower whilst we got dinner underway, Steve and Les arrived to join us a with Simon arriving a short time later. We had a great evening with lots of laughter, good food, great wine and good company. The next day (Monday), Alex and I went off to do a little retail therapy as she needed to purchase a few items to fulfill her role as Maid of Honour and organiser of the hens day/night!! We managed to complete our purchases relatively quickly and efficiently so we had plenty of time to fit in a little relaxing. We headed over to the Shore later in the afternoon as we were due at Claire & Matt’s for dinner and to see their new house. Alex will be returning to NZ in October to Claire’s Maid of Honour. We had a really lovely evening and they have a very nice first home in a lovely setting surrounded by a reserve of native trees. You would not know that you were really in the middle of a big city. Tuesday and we were to pick up another of Alex’s friends and take them both to the airport for their flight to Dunedin. It just so happened that Jacky & Chris’ flight was due in just half an hour later so we were able to pick them up and return them to their home. 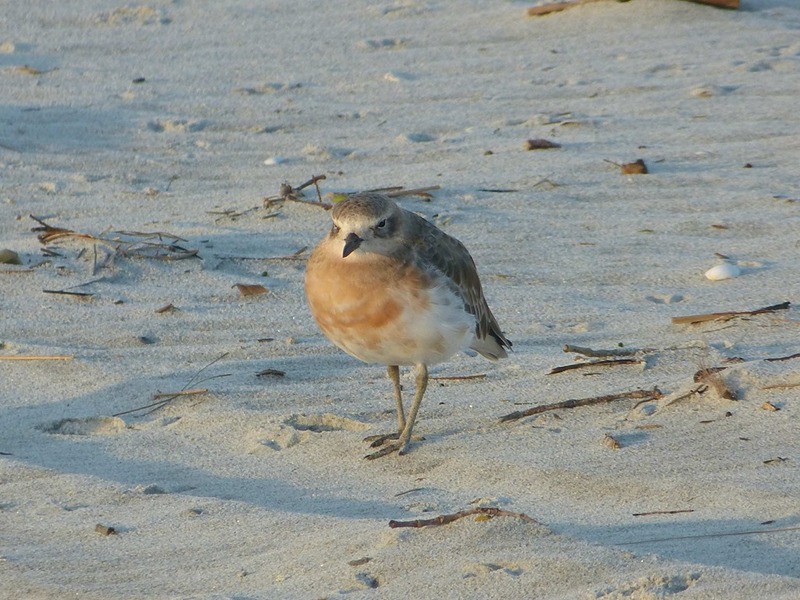 After a catch up with them, we returned to Ardmore and our home. For some reason it seems like we have been away for ages even though it was just a couple of nights. Oh, and I did get a little something brought to me from the UK. I had asked Alex to pick up a toaster for us, for use on the gas stove top. I had brought one back from France three years ago but it had started to burn through on the base. 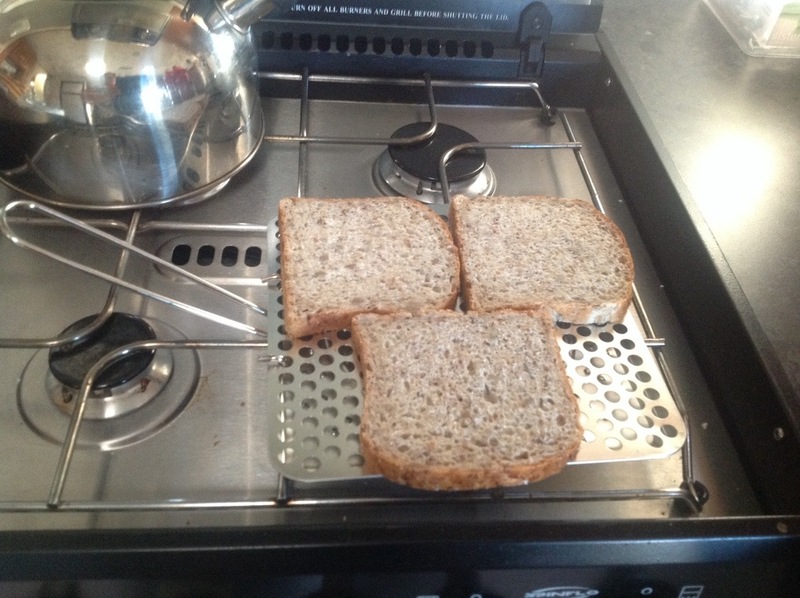 A discussion on toasters took place here https://brvannini.wordpress.com/2010/10/15/ and here https://brvannini.wordpress.com/2010/10/20/. After a little searching on the web, I found a replacement, however it was only available in the UK, but I knew someone was visiting shortly so a request was put in. This version is stainless steel so should last quite a while and at just £4, a bargain! Time to reflect on our extended time in Auckland particularly from the perspective of visitors to the city. Firstly, we must say that we like Auckland, it’s vibrant, colourful, and diverse with lots of lovely beaches, parks and trees, and we really do mean lost of trees everywhere, it is very evident when you look out over the city at just how lush and green it really is. Of course we love Auckland for the opportunity to see family and friends. Two sons, Simon and Antony are in Auckland and it is always lovely to see them both and catch up with them and Simons wife Anita. Then there is family with brother Seve and his wife Leslie, their daughters and grandchildren to catch up on, cousins, nieces, nephews as well. Then there are friends, friends from Roy’s days of growing up in Auckland and friendships made over the years of us living and working in Auckland. What is really great about all these people is that it seems as though we only saw them a day or so ago. We didn’t manage to catch up with everyone, however….we will be back! What we don’t particularly enjoy is the traffic, BUT, it is just a fact of life of being in a big city and you have to allow plenty of time to get from A to B. And just as well we know the roads very well as if we followed the GPS or the non existent signs, goodness knows where we would end up. We do have to say that from the perspective of a visitor to Auckland, the road signage is very poor, particularly if you need to get from the airport (or Ambury) into the city or onto the Harbour Bridge. The signs are either non existent, badly placed, very small or terribly worded. And when roads change names halfway along, it does not help. For example; Manukau Road (which is the main route from the northern motorway exit or city to the South west Motorway I.e. airport) changes its name to Pah Road, which then becomes Queenstown Road, and is signposted as Queenstown Road exit off the motorway. Unless you know that this is the road/exit you need, you could well drive on by. As I said, local knowledge is key, and knowing easier, shorter and better routes than the GPS is also helpful. Then there is the food. The markets and shops with all ethnic variations catered for, we really really enjoy this part of Auckland. From the shops such as Sabato, Farro and Nosh through to the Chinese & Korean Supermarkets and all the fabulous farmers markets, we loved them all. And yes Jacky, that includes spending time with you in the kitchen cooking up a storm. Cooking/eating with Steve and Les is always a pleasure and this time it was great to be part of the great bacon making as well as sampling the salami and sausages. Then there are the Regional Parks, what a huge asset to the city. Where else in the world can you camp in a Park, surrounded by farmland just 15 minutes from the centre of the city? The Parks are dotted all around the region and in some stunning locations. We have really enjoyed visiting a few more of the 26 Parks. All in all a great time in Auckland. Thanx to everyone who made our extended time in the big smoke so pleasurable. See you next time!